In the 1800's thousands of people visited Saratoga Springs to drink the healing waters. In 1848 The Clarke and White Spring Water Company was the first to commercially bottle High Rock water. They purchased the spring and erected a circular brick structure to protect the cone and to bottle the water. In order to dispense water to visitors, dipper boys served customers with a drink of the water directly from the cone. In 1865 William McCaffery and Seymour Ainsworth purchased High Rock and constructed an ornate gothic pavilion crested with a golden eagle. In 1866 the structure was completed at a final cost of $6,000. The cost put them in debt forcing them to declare bankruptcy. 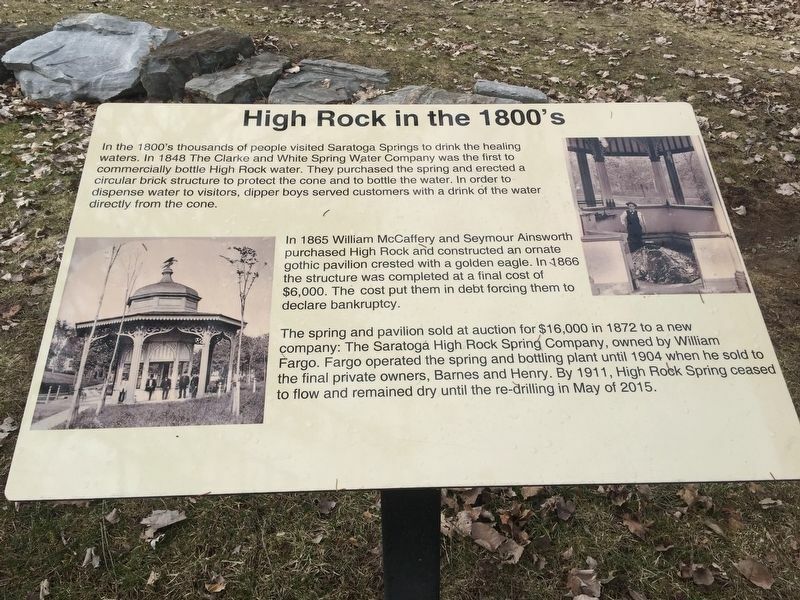 The spring and pavilion sold at auction for $16,000 in 1872 to a new company: The Saratoga High Rock Spring Company, owned by William Fargo. Fargo operated the spring and bottling plant until 1904 when he sold to the final private owners, Barnes and Henry. By 1911, High Rock Spring ceased to flow and remained dry until the re-drilling in May of 2015. Location. 43° 5.217′ N, 73° 46.812′ W. Marker is in Saratoga Springs, New York, in Saratoga County. Marker is on High Rock Avenue, on the left when traveling north. Touch for map. Marker is in this post office area: Saratoga Springs NY 12866, United States of America. Touch for directions. Other nearby markers. At least 8 other markers are within walking distance of this marker. Creation of the Park (here, next to this marker); The Story Starts Here (a few steps from this marker); Saratoga’s First Resort for Travelers (within shouting distance of this marker); Highrock Park (within shouting distance of this marker); Bryan Home (within shouting distance of this marker); Standard Time (approx. 0.4 miles away); New York State County Highway Superintendents Association (approx. half a mile away); Franklin Square (approx. half a mile away). Touch for a list and map of all markers in Saratoga Springs. More. Search the internet for High Rock in the 1800’s. Credits. This page was last revised on April 1, 2019. This page originally submitted on March 30, 2019, by Steve Stoessel of Niskayuna, New York. This page has been viewed 27 times since then. Photo 1. submitted on March 30, 2019, by Steve Stoessel of Niskayuna, New York. • Bill Pfingsten was the editor who published this page.